For the last sixteen years, an ever increasing number of participants from around the world have been making a pilgrimage to the Black Rock Desert north of Reno, Nevada for an event that is unique in the history of all mankind. A city is built purely from the imagination and will of the event’s participants, explored for a week, and is then dismantled and removed from the desert, leaving absolutely no trace of its existence. It is called Black Rock City and the event is most commonly referred to as ‘Burning Man,’ named for the annual burning of a forty-foot-tall wooden effigy that is shaped like a man and sits in the center of the city, serving as the primary reference point for Black Rock’s citizens throughout the week. This unique event had modest beginnings when, in 1991, two hundred or so artists, anarchists, and hedonists moved their yearly party from a San Francisco beach to a massive dried-out lake bed in the Nevada desert to prevent the police and local spectators from disrupting the spontaneity and good-will of the gathering. The pilgrimage quickly became a rite of passage to participate in the event. But despite the difficult journey and almost no formal advertising, growth in attendance to the desert utopia has been exponential and the event now hosts some 40,000-plus participants and possesses a largely self-organized community ethos that seekers of a creative resistance to materialism may find intriguing. The elements of this ethos can be found distilled into ten principles listed on the event’s web site: “Radical Inclusion, Gifting, Decommodification, Radical Self-Reliance, Communal Effort, Civic Responsibility, Leaving No Trace, Participation, and Immediacy”. The reader is referred to Burningman.com for a detailed explication of these, as this article is too brief to cover them. But from the list alone, one can see that the move away from a modern-day city and into the harsh desert environment was not merely physical, but rather the ritualization of a conscious effort to thwart the monolithic forces that overwhelm contemporary life in America and constrict the potential for creative freedom and organic community. These materialistic forces are rapidly spreading throughout the globe. They include, but are not limited to: an instinctive gravitation towards comfort and convenience, the suppression of individuality and creativity through market forces and corporate entities, the centralized bureaucracies of our government and mainstream media outlets, the prevailing faith in what science is and what it can do, a dreamy reliance on technology, and, sadly, this list could go on. Burning Man participants respond to these forces with a creative defiance. 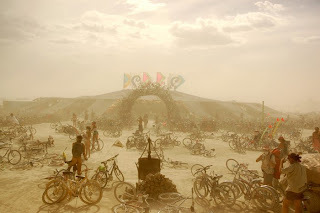 By maintaining a purely gift and barter economy, with no vending or sponsorship, encouraging a conscious relationship with the land and community, and demanding the creative ‘participation’ of each and every individual in a physically harsh environment, Burning Man’s organizers and attendees create a sacred space where post-industrial life can escape the imbedded habits of an artificial existence—just long enough to re-imagine itself through the experience of art. In Black Rock City, Joseph Beuy’s maxim, “Everyone an artist,” has become a reality. Participants go to the ends of the Earth to create extravagant costumes, elaborate bicycles (a Burner’s primary means of transportation on the playa), inventive themed camps for dwelling and gathering, exotic dance floors, innumerable sculptures that dot the desert landscape, multi-story temples that create an opportunity for reflection in a non-dogmatic setting, and perhaps most sensational- art cars. The latter are quintessentially post-modern creations that must be seen to be believed; at any moment in Black Rock City, you might catch a ride on a full-scale pirate ship, a mock Starship Enterprise, a three-stories-tall blooming flower, a thirty-foot-long glowing Cheshire cat, an electric cup-cake, and the list goes on upwards to some two hundred of these beautiful machines of the imagination. We welcome you to join us for the burning of the wooden man at the end of this summer, Aug 27th-Sep 3, and leave you with the formal mission statement of the Burning Man Organization as stated on the web site mentioned above. Our mission is to produce the annual event known as "Burning Man" and to guide, nurture and protect the more permanent community created by its culture. Our intention is to generate society that connects each individual to his or her creative powers, to participation in community, to the larger realm of civic life, and to the even greater world of nature that exists beyond society. We believe that the experience of Burning Man can produce positive spiritual change in the world. To this end, it is equally important that we communicate with one another, with the citizens of Black Rock City and with the community of Burning Man wherever it may arise. Burning Man is radically inclusive, and its meaning is potentially accessible to anyone. The touchstone of value in our culture will always be immediacy: experience before theory, moral relationships before politics, survival before services, roles before jobs, embodied ritual before symbolism, work before vested interest, participant support before sponsorship. 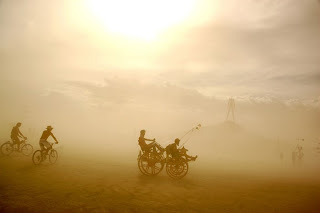 Finally, in order to accomplish these ends, Burning Man must endure as a self-supporting enterprise that is capable of sustaining the lives of those who dedicate themselves to its work. From this devotion spring those duties that we owe to one another. We will always burn the Man. 1. Stegmann, Carl. The Other America. Fair Oaks, CA: Rudolf Steiner College Press, 1997, pp 191. 2. Ibid 146 3. Gilmore, Lee and Mark Van Proyen, eds. 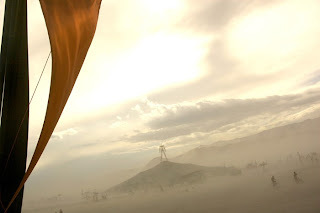 Afterburn: Reflections on Burning Man. University of New Mexico Press, 2005.